Egyptian president Abdel Fatah al-Sisi on Monday told United States Secretary of State Rex Tillerson that his country’s stance towards the Israeli-Palestine peace process is to ‘establish a Palestinian state on the 1967 border, with Eastern Jerusalem as its capital’. 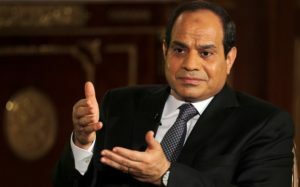 In a statement released on Monday following private talks with the US Secretary of state, President Sisi called on Washington to revive the peace process between Palestinians and Israelis. Rex Tillerson is conducting a tour of the Middle East that started in Cairo and will see him discuss the Syrian crisis and Middle East peace with allies in the region. Besides the Israeli-Palestinian crisis, talks between al-Sisi and Tellerson also focused on the fight against terrorism, a State Department spokeswoman said. According to Tillerson, the US administration remains committed to achieving a peace agreement between Israelis and the Palestinians. The Peace process between Palestine and Israel has been halted since April 2014 and President Donald Trump’s decision to recognize Jerusalem as the capital of Israel will not help put the process back on track, as the Palestinians have rejected Washington as a peace broker in the decades-long Israeli-Palestinian conflict and talks. The US top diplomat’s trip to Cairo comes after Vice-President Mike Pence visited last month Egypt to discuss security in the region and future of US aid to al-Sisi. Written by: KanelkaTagba on February 13, 2018. Posted by KanelkaTagba on Feb 13 2018. Filed under Headlines, World News. You can follow any responses to this entry through the RSS 2.0. Both comments and pings are currently closed.